These smiling people are just a few of the dozens of volunteers who work hard to feed the hungry in our community. These generous women and men prepare and serve a nutritious hot meal three days a week in our parish hall. They also pack and distribute two bags of donated groceries to scores of families in need every Tuesday. Other volunteers in this ministry include students from St. Pius V School and Benito Juarez High School as well as a group of young men who come by bus every Friday noon from St. Laurence High School in suburban Burbank! If you are making a Giving Tuesday gift this year, please consider not only the individuals and families who benefit from our emergency food assistance program, but think of your donation as a show of support to these hard-working and generous volunteers. You can make a safe, secure, online donation to the mission of St. Pius V parish – including the food pantry and soup kitchen – by clicking here. 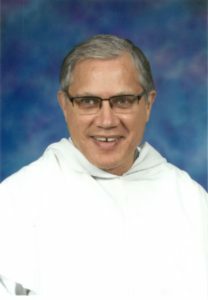 Happy Thanksgiving from Fr. José and St. Pius V Parish! We have a wonderful Thanksgiving Day tradition at St. Pius V of celebrating Mass at 11:00 am and then hosting a community dinner in our parish hall. I invite you to join us this Thursday! Both Mass and dinner are open to all: parishioners, friends, and many who have nowhere else to go for the holiday. 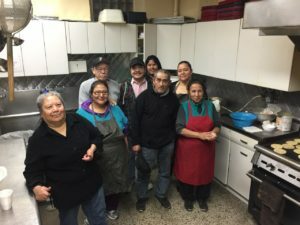 The meal is prepared and served by a dedicated team of volunteers led by parishioner and coordinator Yesenia Serva. Many of those who break bread with us on Thanksgiving are people who have visited our parish soup kitchen and food pantry throughout the year – often sitting side by side with benefactors whose generosity has made all this possible. Thanksgiving at St. Pius V really started last Saturday as our parish hosted a large distribution of donated turkeys and other foods for families in need. On behalf of all who participated, I thank H. Kramer and Company, Richards Supply, HFS Chicago Scholars, the 12th District of the Chicago Police Department, and Manuel Perez School for their generosity and volunteer spirit in making this happen. Some of the generous, talented people we honored at Volunteer Appreciation Night on November 19. Last Saturday we also hosted our annual Volunteer Appreciation Night in the parish hall. Along with food, music, and dancing, we celebrated and thanked the dozens and dozens of volunteers who make this parish such an active and engaged community of faith. As we pause this week and express our gratitude to God for the many blessings in our lives, I give thanks for the parish family – parishioners, staff, school families, volunteers, and benefactors – of St. Pius V for the spirit of service and love that marks all that we are and do. May God bless you and your loved ones on this Thanksgiving Day and always! Your support allows us to minister to individuals and families in many ways, including the more than 45,000 meals made possible each year by the food pantry and soup kitchen in our parish hall. Please consider a Thanksgiving donation in support of the ministries and social outreach of St. Pius V parish. Thank you! 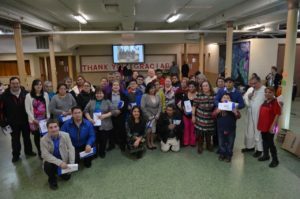 Our parish family recently honored the many volunteers who give so generously of their time and labor to make the ministries of St. Pius V a reality. For photos of the event, including pictures taken with the Volunteer Night frame, please visit our online folder here. For more information on photos please contact the parish office at 312-226-6161. Thank you to our parish volunteers! Support St. Pius V Church and School Through Your Online Shopping! #StartWithaSmile at smile.amazon.com/ch/36-2240477 for your holiday gifts and Amazon donates to St Pius V Church & School. This costs you nothing and you will have the same shopping experience on Amazon, including prices and specials and memberships, but by starting at smile.amazon.com/ch/36-2240477 you trigger the automatic donations – a percentage of the dollars you are spending – to St. Pius V.
Please share this with family and friends as well. This is an easy way to support the mission of our school and parish! Today our church marks All Souls Day, officially called the Commemoration of All the Faithful Departed and popularly known in Latin America as el Día de los Muertos. 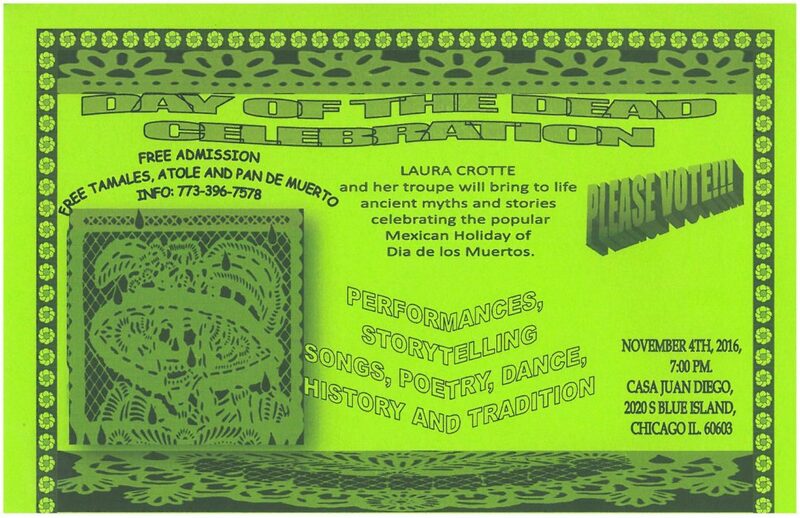 St. Pius V parish invites you to join us today (Wednesday) for Rosary at 6:30 pm and Mass at 7:00 pm in our church as well as Friday, November 4 for an artistic and cultural celebration in Casa Juan Diego (see attached flyer). All are welcome!